Top Shelf® Potting Soil is proud to be an OMRI® listed organic product. We start by taking our Top Shelf Compost then add sand, pine bark, perlite and a starter charge of Medina® Growing Green Fertilizer. This mix forms an ideal media for your plants to grow strong in container pots, raised beds, or your garden. The Top Shelf Compost in this mix has met the STA requirements set forth by the US Composting Council®. 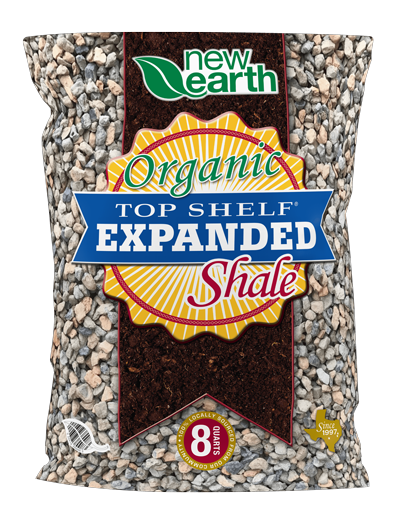 Apply 2”-4” of Top Shelf® Potting Soil to entire planting area and mix together with a spade or shovel. Depending on plant type, container size, and placement keep the soil moist but not saturated. After planting, continue watering as directed. When planting new plants: fill the pot with Top Shelf® Potting Soil and plant as normal. Use Top Shelf® Fertilizers to encourage continued plant growth year round.